In January California Transportation Commission heard testimony from representatives for the NCRA and Friends of the Eel River, as well as other stakeholders in the future of the Northwest Pacific line. Click here to watch video footage of the hearing (select January 31 2018 Pt 2). Click here to read more about the CTC hearing. In February, State Senator Mike McGuire introduced SB 1029, The Great Redwood Trail Act. The legislation is intended to dismantle the NCRA, railbank the Northwest Pacific line, and establish a multi-use trail along the canyon in a “rails to trails” process. Friends of the Eel River remain engaged in the drafting of this legislation to ensure that cleanup of the existing rail line (including removal of toxics and removing fish passage barriers) is fully funded, and that any trail development complied with California Environmental Quality Act. Click here to read more about FOER’s vision for the Great Redwood Trail. We presented oral arguments before the California Supreme Court in San Francisco on May 3. Click here to watch a video recording of the hearing. In July the Justices published their opinion, declaring Friends of the Eel River victorious, and that California Environmental Quality Act does apply to state-owned rail projects. The NCRA responded by seeking appeal with the Supreme Court of the United States. Meanwhile, the California Transportation Commission in July asked the NCRA to “prepare a shut-down plan“, in light of their negligent use of state funds. In their annual report to the California legislature, the CTC suggests forming a legislative committee to “explore various scenarios for the Agency’s future”. 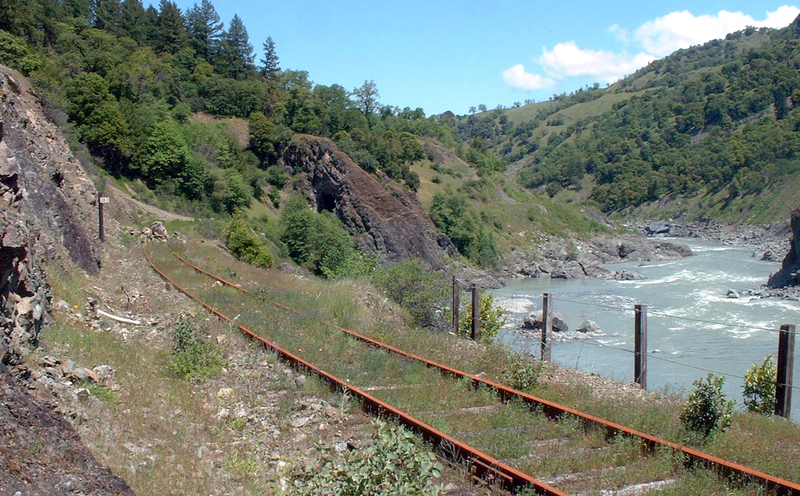 Friends of the Eel River and Californians for Alternatives to Toxins filed a notice of intent to sue the North Coast Railroad Authority on June 7, 2011. In March 2018 Senator Mike McGuire introduced the Great Redwood Trail Act, legislation intended to dissolve the NCRA, railbank the line, and establish a multi-use trail through the Eel River canyon. Click here for our archive of articles about the North Coast Railroad Authority.